When I was a kid I must have gone through Emberley's books ten times each. I can't draw to save my life, but they were so much fun, and I am so happy that they're still in print! Ed Emberley starts where most elementary-aged kids are at (stick figures) and brings drawing to the next immediate level of complexity. No shading, still just two-dimensional, but able to capture more of the world. Children tend to be very methodical and formulaic in their drawing--what they haven't seen others draw before, they tend to lack the imagination and talent to figure out (on their own) the technique for rendering it in a recognizable form. What most need is an engaging mentor that will help them simplify the complexity down to something they can comprehend and replicate. Children naturally enjoy creating their own worlds and stories through art, and this author-illustrator increases their repertoire, bringing more joy to their fingertips. While a natural artist who wants to make things look realistic may feel stifled by the approach, it will teach him/her to use basic shapes to create forms, to have an eye for detail, and to use boldness in graphic art to create impact and communicate clearly one's ideas. I would strongly recommend each of his color-themed titles (orange, purple, green, etc. ), as well as his finger/thumbprint books and his "make a world" book. All will bring smiles and inspiration to young artists ages 5-12. Fan of Ed Emberley. Love how he breaks everything down into simple easy steps with basic shapes & lines. Love all the pumpkins, tigers, etc... featured in this how-to book! Especially the haunted house ~ SO COOL! It's Orange and you can draw stuff. 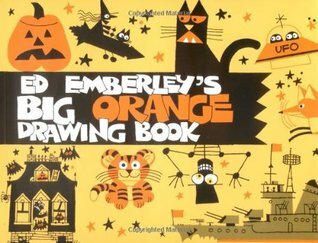 Ed Emberley - American artist and illustrator, best known for children's picture books.